This project has been a long time coming, but finally it’s finished. 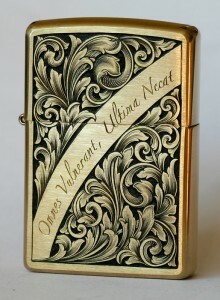 Engraved Zippo lighter number 9. Is the Latin a commentary on the cigarette you’re presumably lighting with the lighter? Hi, got any info on that zippo? What info do you mean?